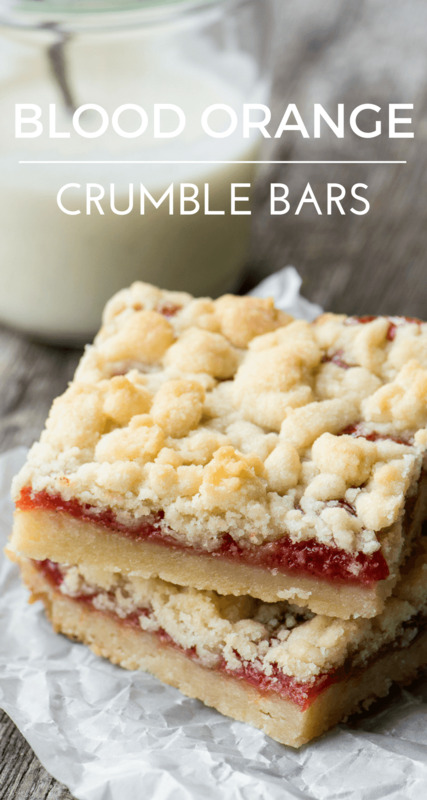 Blood Orange Crumble Bars ~ the sweet tart filling is layered into a buttery shortbread crumble dough ~ this easy dessert or breakfast treat is delicious! Set oven to 350F Lightly spray and line a 9x9 square baking pan with parchment paper with long ends so that you can lift the cooled bars out for easier cutting. This is optional. Cream the butter and sugar together until well combined and fluffy. Blend in the salt and vanilla. Add the flour gradually and mix until just combined. There should be no more dry flour left, but the mixture will be crumbly. Take approximately 2/3 of the dough and pat it into the bottom of the pan. I like to drop crumbles of the dough all over the bottom to distribute it before I start patting it down, this helps get the bottom covered evenly. Spread the jam evenly over the dough. Using your fingertips, crumble the remaining dough over the jam. Bake for 35-40 minutes, until the bars are just starting to turn golden. If you are glazing the bars, let them cool completely before glazing. To make the glaze, whisk the sugar and vanilla with enough milk or cream to get a glaze consistency. Drizzle liberally over the cooled bars.